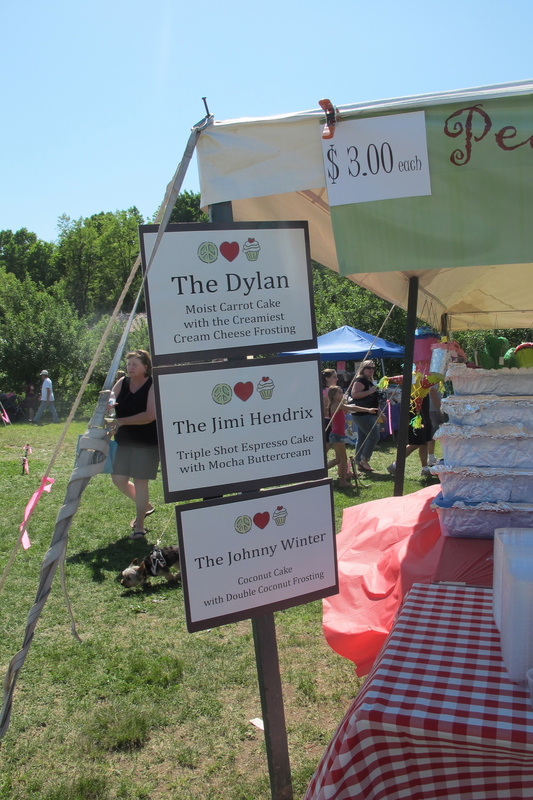 The Gardiner Cupcake Festival, the only cupcake festival in the Hudson Valley, was held at Wrights Farm this Sunday. The event has grown in popularity with a thousand guests attending this year, showing that the switch of venue from Main Street was a needed decision for the burgeoning festival. Vendors from across Upstate New York, New York City, and New Jersey presented their best in show. The event boasted activities such as wine tasting, face painting, zip lines, tractor and pony rides, and of course cupcakes! Deising’s Bakery, Restaurant and Catering’s artful creations caught the attention of children and adults. Another notable flavour came from Sweet Maresa’s Upstate Cupcake. The cupcake in question was Chocolate Lavender, made with lavender leaves from Tweefontein Herb Farm. Maresa stated that the flavour was birthed from a desire to collaborate with Tweefontein Herb Farm, a farm collectively run by young people in New Paltz, New York. Bettie’s Cupcakes towered over the competition, literally. The cupcake company had a furnished double decker bus. They dished out cupcakes through the side and had convenient seating on the upper level. It was a novelty that attracted a good crowd. Kupcake Kouture’s twist on the classic cupcake, the Cupcake Push Pop. 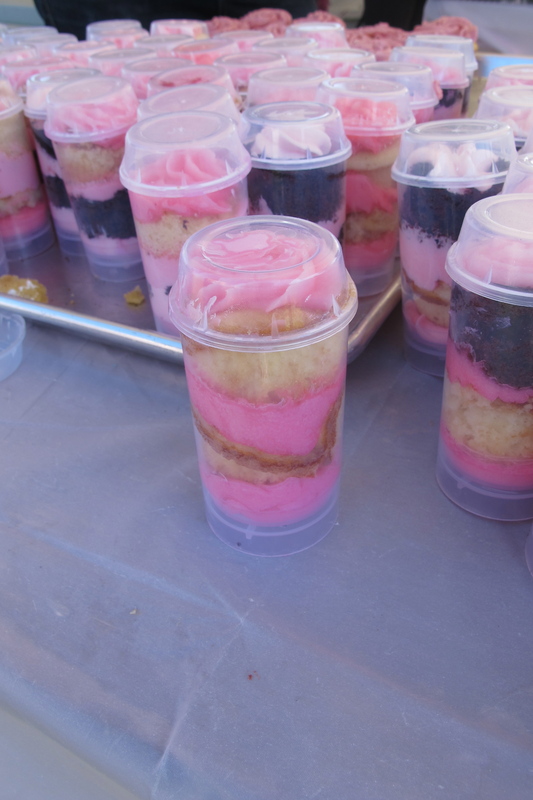 Deising’s Bakery, Restaurant and Catering from Kingston took the (cup) cake for most aesthetically pleasing treats. 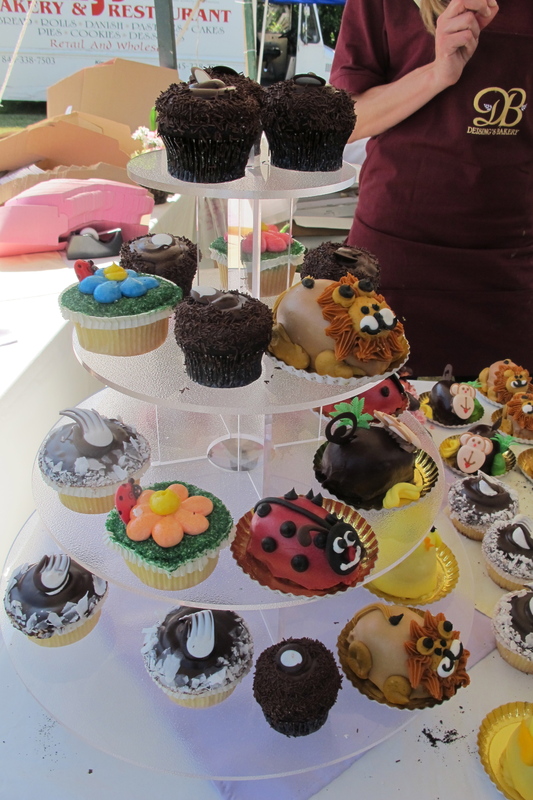 Their cupcakes were figurine-esque creations of animals like lions, ladybugs, and monkeys that were so beautiful that it was a shame to eat them. Newcomers Kupcake Kouture from Bayonne New Jersey surprised with a new cupcake invention: Push Pop Cupcakes. Other cupcake companies took inspiration from their local area such as Peace, Love & Cupcakes. The Woodstock based company has named their creations after notable personalities over history. Peace Love & Cupcake’s cupcake selection. For those without a sweet tooth there were ample savoury options. Local vendors supplied falafel, pretzels, and pizza. Full Moon Farm cooked up some grass-fed steak, hot dogs, and burgers. All of this could be enjoyed while watching live acts on the main stage or taking a gander at the Amateur Baker Cupcake competition. Overall the festival was a great family friendly day that didn’t break the budget (most cupcakes were around three dollars). It was great to see the range of local talent in Upstate New York and the surrounding areas. Lindsay from Peace Love and Cupcakes with their Woodstock Tie-dye Vanilla Buttercream cupcake. Sweet Maresa’s Upstate Cupcake Chocolate Lavender cupcakes. Moxie cupcake’s ‘School Days’ with peanut butter and concord jelly. Carly Mitchell showing off Moxie’s fine selection of cupcakes. An Amateur Baker Competition contestant. Votes were given by putting a penny in the cupcakes jar. An Amateur Baker Competition contestant. Bettie’s Cupcake stand housed in a double decker bus. A little chick created by Deising’s Bakery, Restaurant and Catering from Kingston. Forest Fest is a music and arts festival held in New Paltz, in upstate New York. Held this year at the Center for Symbolic Studies, the Festival has developed greatly from previous years but hasn’t lost any of its grass roots charm. A varying line-up of dubstep, electronic, punk, rock and reggae kept the crowd pleased. Besides music there was plenty to keep people entertained. A car was left at the whim of the crowd to be decorated and hulahooping was very popular. Food wise local vendors, such as Rock Da Pasta, offered affordable and delicious options. ‘The Good Person of Szechwan’ directed by Ashley Kelly Tata was a highly memorable reinterpretation of Brecht. Traditional Brechtian techniques were harnessed but altered to create a piece that was eerie and absurdist. Its distinct aesthetic was reminiscent of Edward Scizzorhands, with large eighties hair and outlandish make up. Staged at the Riverside Theatre, the play fit all too snugly in the context of the recession. Combined with Tata’s direction the set was used to create dynamic, shocking images. Most notable was the theatrical imagery displayed in ‘The Song of The Eight Elephants’. Orange lighting combined with the mechanical dance choreography created a distinctive dystopia while high pitch singing and hair-nets only added to the scene. This quirky atmosphere was echoed in the intriguing music. Paul Pinto matched the feel of the piece wonderfully using eerie guitar plucks and a cello. Inventive sound effects such as pouring a watercan into a steel bowl to evoke rain, were also used. New Media was harnessed to a great extent. Direct address was shown through a camera attached to the roof. This was used to great humorous effect when Mrs Shin tries to figuring out who Shen Te is talking to, breaking the illusion. The characterisation of the Gods was by far my favourite. The Gods were presented as the cookie cutter perfect American family, on the tip of mental break down. Stylised movements and melodrama was used to great effect. Tata projected the gods on a white sheet, but also allowed the audience to see the Gods being filmed in front of a green screen behind. A transparency of technique that I’m sure Brecht would applaud. Notable actors were Mrs Shin played by Kate Hamill, Wang The Water Seller by Micheal Brahce and all of the Gods.